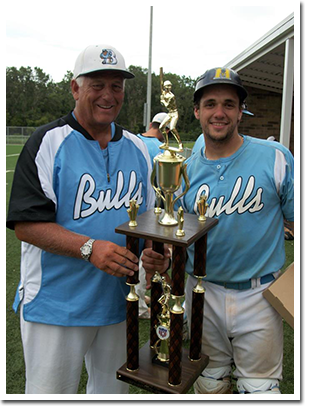 Frank founded the Michigan Bulls in 1996 with one 14U team that would eventually play in three AABC World Series’ in five years, including a trip to the Connie Mack World Series in 2000. Since then Frank has coached the Bulls’ 18U and 22U teams, amassing over 1,000 wins in that time. He has helped develop hundreds of Division I and II players from around the state and the Midwest. In 2004, Frank opened the doors to the Bullpen Baseball Academy with now Tiger’s pitching coach Jeff Jones. The Bullpen is the current home of the Michigan Bulls with over 12,000 sq feet of training space. Frank’s most successful seasons include trips to the AABC World Series in 1996, 1998, 2000 and NABF College National Champions in 2005 and 2012. Frank also scouted for the Seattle Mariners for 10 years and is currently scouting for the Texas Rangers. Frank started his playing days in Chester, Pennsylvania at St. James Academy where he would eventually be inducted into their Hall of Fame as a baseball and football standout. After high school he attended the University of North Carolina, again staring in both baseball and football. Frank’s football career then took off as he left Chapel Hill for the NFL where he made a seven year career with the Detroit Lions, Minnesota Vikings and Atlanta Falcons.